​​Every month a student of the Integral Ballet School is honored for noteworthy achievements, extraordinary behavior and/or general excellence. These achievements may or may not be dance-related, but show what it means to be an exemplary student of ballet. We love to see our students going above and beyond in every area of their lives. Our October Student of the Month is Cassie J. Cassie has been studying at Integral since 2010 and recently earned her pink belt. Cassie will be preparing to begin pointe this spring and has shown tremendous dedication to her ballet training. 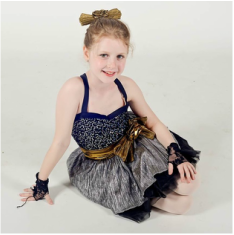 In addition to ballet, Cassie studies tap and jazz and recently received accolades for being an outstanding dancer in her theater group. Way to go Cassie! Keep up the great work.